DKA can be life threatening. The three complications which account for the majority of deaths in these children are cerebral oedema, hypokalaemia and aspiration pneumonia. An understanding of the principles discussed in the ‘Approach to the Seriously Unwell Child’ article and an awareness of the British Society of Paediatric Endocrinology and Diabetes (BSPED) guideline for DKA management (1) will help you manage these children appropriately. 31,500 children and young people under the age of 19 in the UK have diabetes. The vast majority of them (over 95%), have Type 1 Diabetes Mellitus (T1DM.) The peak age for diagnosis is between 9 and 14 years (2). In established T1DM, the risk of DKA is 1–10% per patient per year (3). Reported mortality rates from DKA in children in the UK are around 0.3%, the majority of which are attributable to cerebral oedema, which has a mortality rate of 25 % (4). T1DM can be seen as ‘starvation in the midst of plenty,’ where blood glucose levels are raised as it cannot be used for metabolism or stored due to an absolute deficiency of insulin. This leads to a rise in counter-regulatory hormones including glucagon, cortisol, catecholamines and growth hormone. The increase in these gluconeogenic hormones not only raises the blood glucose concentration further, but also leads to accelerated break down of adipose (fatty) tissue, resulting in rising levels of acidic ketone bodies (beta-hydroxybuturate). The hyperglycaemia and subsequent glycosuria causes an osmotic diuresis and the patient becomes polyuric, resulting in dehydration. Vomiting is common in DKA and further compounds the dehydration and stress resulting in a perpetuating cycle of worsening acidosis and dehydration. Unless insulin is given, this process continues to spiral out of control and can be fatal. The figure below summarises this information. DKA is often the presenting feature of diabetes in children. Reported frequencies of DKA at onset of T1DM range from 15% – 67% in Europe and North America, and are usually higher in developing countries (6). The mean duration of symptom before the child presented in DKA was 16.5 days. These two figures are important because the child’s symptoms may often have been put down to another illness by the parent or GP and it is therefore important to explore these recent symptoms in more detail and have a low threshold for testing a bedside blood glucose in all unwell children. The symptoms of DKA often include feeling generally unwell and lethargic, nausea and vomiting and abdominal pain. Early cerebral oedema may produce headache and irritability, progressing to confusion, drowsiness or collapse. There may also be symptoms of concurrent infection such as fever, cough, diarrhoea or dysuria. It is also useful to explore the family history of DM or other autoimmune conditions. In known diabetic patients, ask specifically about their current insulin regimes and doses and their recent control. You should also establish a good insight into their overall diabetes management including their named consultant, clinic follow up and previous admissions. Make an assessment of the patient’s conscious level (using AVPU or GCS) including ‘neuro-observations’ – heart rate, blood pressure and pupillary response to light. Signs of cerebral oedema are irritability, slowing pulse, rising blood pressure and reducing conscious level. Papilloedema is a late sign. Note that fever is not a feature of DKA. If present, suspect an underlying infection. Weigh the child wherever possible as this is useful when considering later fluid calculations. Hyperosmolar Hyperglycaemic State – this usually occurs in T2DM patients, especially when there are learning difficulties or other factors preventing proper hydration. These patients present with signs of hypovolaemia and marked hyperglycaemia but there is no ketone production or acidosis. Serum osmolality is usually 320mosmol/kg or higher. Acidosis from another cause such as renal failure or substance ingestion (Salicylate toxicity). Bedside blood glucose and ketones from finger prick. Urinary ketones can be used to diagnose DKA on a urine dipstick if blood ketone testing is not available, but obtaining urine samples from unwell, dehydrated patients can be difficult. They are also a delayed and indirect method of testing for ketones, indicating blood levels of ketones approximately four hours previously. Blood gas – A capillary or venous sample can be used and gives the acid-base balance as well as the electrolyte values. Laboratory samples for blood glucose, U&Es and creatinine should be sent at the time of cannulation. These may show acute renal impairment with a raised urea and creatinine. It is important to note that unwell children and their concerned parents can find these acute situations with multiple investigations very upsetting. This is particularly crucial for first presentations of diabetes because these children will need repeated bloods as an inpatient, followed by a lifetime of blood sugar testing, insulin injections and outpatient clinics. Getting it ‘wrong’ the first time can have a devastating effect on this trust relationship and so making the experience as pleasant as possible from the offset is vital. This may mean involving a play specialist or using local anaesthetic cream during cannulation (if the child is stable enough to allow for this). The management of DKA in paediatric patients differs to that in adults. The main reason for this is that children are at a much higher risk of developing cerebral oedema in the rehydration phase of treatment. The BSPED DKA Guideline (1) can be accessed online and gives a full description of the recommended management for this condition. This includes an online fluid calculator which is particularly useful since fluid calculations can be complex as the clinician must take into account fluid deficit and maintenance. It is recommended that a printed copy of the fluid calculator results is placed in the patient’s medical records. A summary of the key points of DKA management using this guideline is given below. Airway – Ensure that the airway is patent and consider intubation if there is reduced conscious level -this will involve contacting the anaesthetic and paediatric intensive care team. Breathing – Administer high flow oxygen via a non-rebreathe mask. Circulation – Most children in DKA will have signs of significant dehydration and will require carefully calculated IV fluid replacement and maintenance. Only the sickest children will have signs of clinical shock. It is only these patients with signs of shock who should be given a fluid bolus of 10ml/kg 0.9% sodium chloride. Further boluses may be considered following senior advice. Disability – If there is a reduced conscious level or vomiting then insert an NG tube and leave on free drainage to prevent aspiration of stomach contents. Have a high index of suspicion for cerebral oedema. Expose – If there are signs of sepsis (fever/hypothermia, hypotension, refractory acidosis or lactic acidosis,) treat with IV antibiotics as per local guidelines. The management of children in DKA should always be discussed with the responsible senior paediatrician. If the child is alert, not clinically dehydrated and not vomiting, it may be possible to treat DKA with oral fluids and subcutaneous insulin, even if blood ketones are very high. Most children however, will require the initiation of IV fluid replacement followed by the addition of an insulin infusion. The fluid to use is 0.9% sodium chloride with 20mmol potassium chloride in each 500ml bag. Total fluid replacement should be corrected over 48 hours at an even hourly rate. DO NOT include bolus fluid given in the ongoing fluid calculation, unless more than 20ml/kg bolus is given, in which case subtract only the amount above 20ml/kg which has been given e.g. if 30ml/kg bolus given, subtract 10ml/kg from the fluid replacement calculations. DO NOT give oral fluids to a patient receiving IV fluids for DKA. Mouth rinses are acceptable for comfort. Insulin should be delayed for 1-2 hours after beginning IV fluid therapy as this has been shown to reduce the chance of cerebral oedema. A dose of 0.05 – 0.1 units/kg/hour of a soluble insulin such as Actrapid is usually sufficient. Blood glucose and ketone levels should be checked hourly and ketones every 1-2 hours. In patients with DKA, there is a depletion of total body potassium, despite normal or high potassium levels in the blood before treatment is initiated. The gluconeogenic hormones cause potassium to be transported out of cells and into the blood. Large amounts of potassium are subsequently lost in the urine as part of the osmotic diuresis. Once treatment is started with Insulin, the extracellular K+ in the blood is taken up by cells via the sodium-potassium pump and it is common to see hypokalaemia on subsequent blood tests. It is therefore vital to replace potassium as part of the treatment of DKA, and to monitor levels closely. If the patient is hyperkalaemic on admission, urine output must be documented before further potassium is given. U&Es should be repeated 2 hours after commencing treatment, and then at least every 4 hours. ECG monitoring should continue throughout treatment in order to look for cardiac signs of hyper and hypokalaemia. Children in DKA require one to one nursing. Vital nursing observations include strict fluid balance monitoring and hourly observations with BP and GCS. Regular reviews by the medical team should include repeated blood glucose, ketones, blood gas and U&Es. The results of these guide further fluid and insulin management – please see the full guideline for full details. Oral fluids can be commenced once ketosis is resolving and there is no nausea of vomiting. DKA is considered to be resolved once the child is clinically well, drinking and tolerating food and the blood ketones are less than 1mmol/litre or pH is normal. Subcutaneous insulin can then be started and IV insulin stopped one hour later. Further care then involves liaising with the diabetic team regarding patient (and parent) education and planning towards discharge. This is the leading cause of death in children presenting with DKA and occurs in up to 1% of cases with a 20-25% mortality (8). The exact pathophysiology of this process is not known, and debate remains about whether rapid treatment with insulin and fluids is a contributing factor. The available evidence is conflicting, however, caution is advised with the speed of fluid resuscitation and timing of IV insulin treatment. Careful and regular observation of neurological status should be documented. Headache, confusion, irritability, increasing drowsiness, hypertension with bradycardia and focal neurological signs such as cranial nerve palsies and papilloedema are all signs suggestive of cerebral oedema. Life threatening arrhythmias can occur as a result of potassium depletion. Regular blood tests are required during treatment and the child should be monitored for cardiac changes. If the hypokalaemia is severe the insulin infusion may need to be reduced or stopped temporarily. Central venous access may be required in order to give more concentrated solutions of potassium chloride. Children with a reduced conscious level are at high risk of aspirating, especially those with an associated ileus or gastric paresis, which can lead to an aspiration pneumonia. NG tube insertion in these patients helps reduce the risk. Blood glucose level should be monitored closely when giving IV insulin as the blood glucose can fall rapidly, causing hypoglycaemia. Rehydration fluids should be changed to include glucose once blood glucose falls to 14mmol/l to prevent this. The majority of children who present in DKA will recover well and be discharged home within a few days, although one study has shown a risk of long term intellectual deficit in children who have had an episode of DKA (9). However, it is the ongoing education and support from the diabetic multidisciplinary team as well as the engagement from the child and family which will have the largest impact on their further diabetic control. (3) Wolfsdorf J, Craig ME, Daneman D, et al. Diabetic ketoacidosis, ISPAD Clinical Practice Consensus Guidelines 2006–2007. Pediatr Diabetes 2007;8:28-43. (4) Edge JA, Ford-Adams ME, Dunger DB. Causes of death in children with insulin dependent diabetes 1990–96. Arch Dis Child1999;81:318–23. (6) Wolfsdorf J, Craig ME, Daneman D, et al. Diabetic ketoacidosis, ISPAD Clinical Practice Consensus Guidelines 2006–2007. Pediatr Diabetes 2007;8:28-43. (7) Juliet A Usher-Smith et al. Factors associated with the presence of diabetic ketoacidosis at diagnosis of diabetes in children and young adults: a systematic review. BMJ 2011:343:d4092. (9) Ghetti S, Lee JK, Sims CE, Demaster DM, Glaser NS. Diabetic ketoacidosis and memory dysfunction in children with type 1 diabetes.J Pediatr. 2010 Jan. 156(1):109-14. Which is NOT a counter-regulatory hormone that rises in T1DM? Which is NOT a symptom expected in a typical history of T1DM? Which is generally part of the DKA triad? Which is a complication of DKA management? 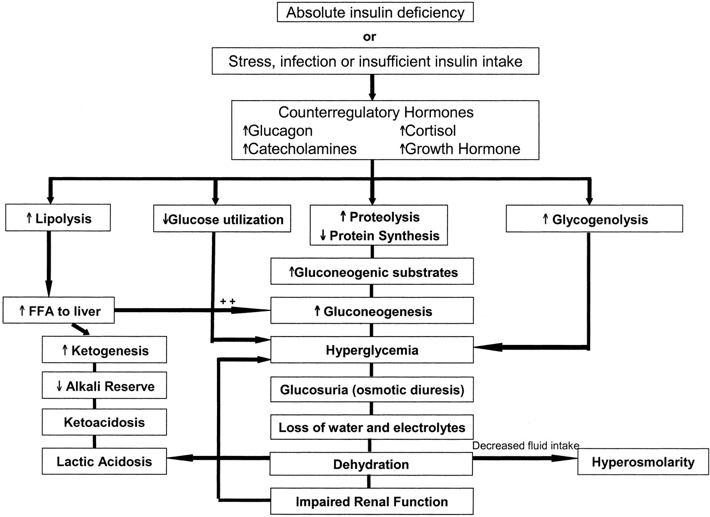 What happens to gluconeogenesis in DKA? What is the mean duration of symptoms before a child presents with DKA? What late sign of neurological compromise should be checked for using fundoscopey? What classification does a child in DKA with a blood pH of 7.08? What is the assumed fluid deficit in a child with moderate DKA? When should insulin therapy be administered? What is the leading cause of death in children presenting with DKA?